I hope you have a wonderful holiday surrounded with friends, family, and good food! Merry Christmas!! Top: Ribbed Mohair Black Sweater from Gap. Steal: Ribbed Mohair Black Sweater from Gap. Splurge: Merino Wool Tippi Sweater from J.Crew. Steal: Floral Fixation Black Lace Dress from Lulu*s.
Earrings: Theroux Statement Clip on Earrings thanks to Mimi Boutique. Steal: Theroux Statement Clip on Earrings from Mimi Boutique. 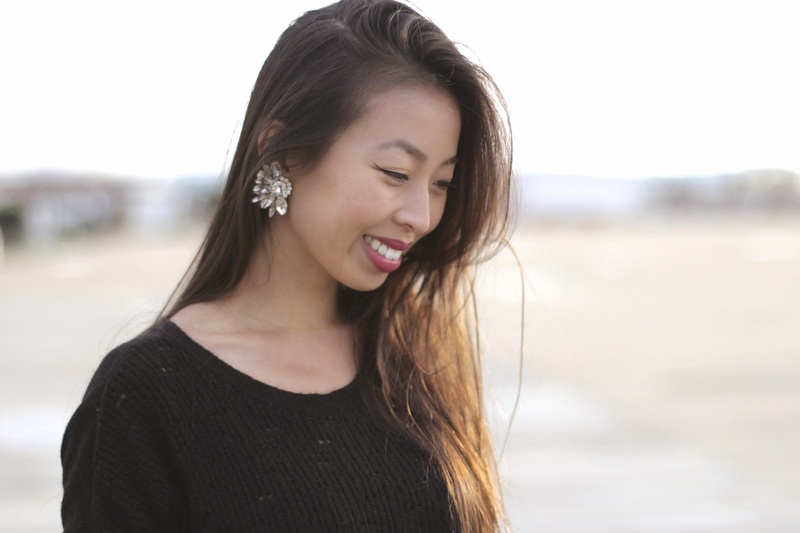 Splurge: Nina Cluster Drop Earrings from Nordstrom. Bag: Cheville Studded Clutch in Grey from Mimi Boutique. Steal: Cheville Studded Clutch in Grey from Mimi Boutique. Splurge: Valentino Rockstud Flap Clutch from Nordstrom. Shoes: Grey Suede Pointed Top Pump thanks to Deb. Steal: Grey Suede Pointed Top Pump from Deb. Splurge: SJP 'Fawn 100' Pump in smoke suede from Nordstrom.